New York— While three in four New York State parents believe high school graduates today should be ready for college, only 43 percent of parents believe that NY’s current high school graduates are in fact ready, according to a new statewide poll commissioned by The Education Trust–New York and conducted by Kiley & Company. 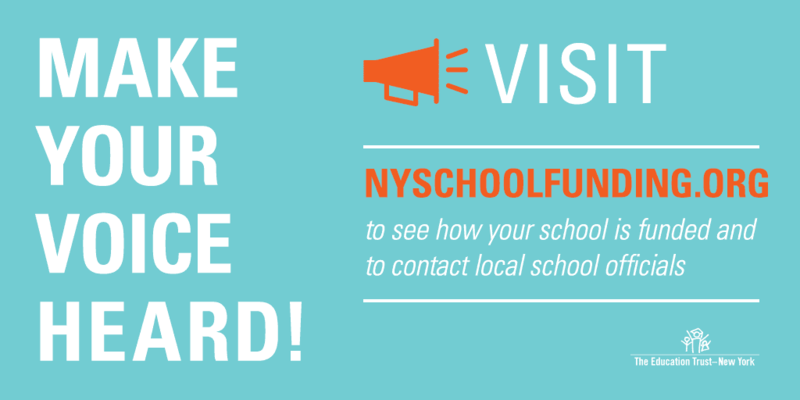 This poll comes as state policymakers are working to craft New York’s new education accountability and support system under the federal Every Student Succeeds Act, or ESSA. When broken out by race: 38 percent of African American parents, 42 percent of Latino parents, and 44 percent of White parents agree that schools are preparing students for college. More than a quarter (27 percent) of all parents say current high school graduates are not ready for college, career, vocational school or a job. Looking at how different groups of parents view their schools is important, as African American, Latino and lower-income families represent the majority of New York State’s public school students. However, along with other groups including English learners and students with disabilities, their children have been historically underserved—resulting in major opportunity and achievement gaps. These parents have too often been left out of the conversation about critical education policies. To delve deeper into what parents have to say about the state of New York’s schools, the poll also found that the majority of parents from all racial groups support grading schools just as students are graded and evaluated, with support highest among African American and Latino parents (83 percent and 80 percent, respectively, compared to 60 percent for White parents). 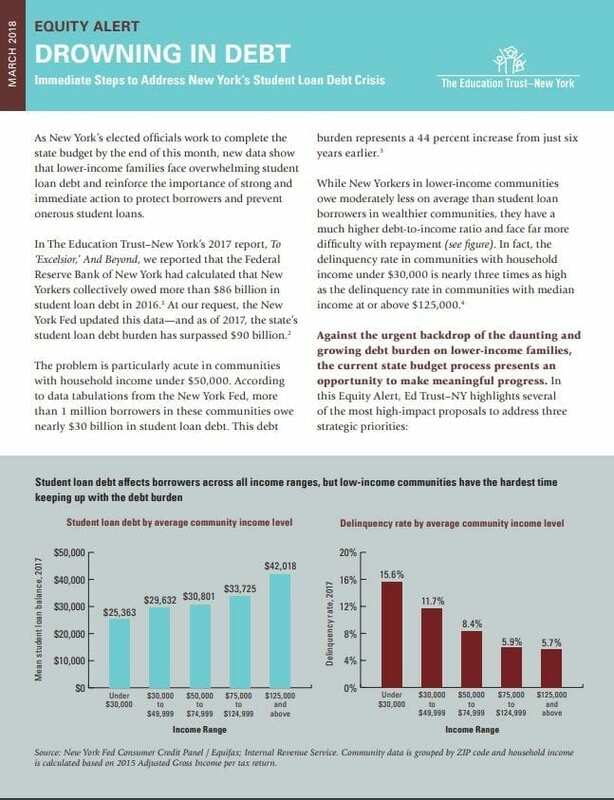 Eighty-three percent of parents in households making under $50,000 agreed with grading schools in some fashion, compared to 73 percent of those in the $50,000-$150,000 bracket and 67 percent of those making over $150,000. 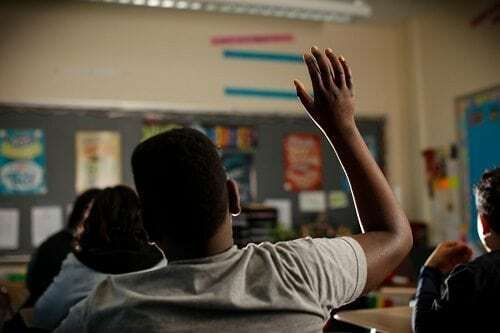 A substantial proportion of African-American parents (42 percent) believe public schools do a better job for students of other races than they do for African American students, according to another finding. These views are particularly relevant as New York state works to finalize its plan to implement the new federal education law, ESSA, which gives states more flexibility on how they craft their education accountability measures. ESSA asks states to make crucial decisions about what it means to be a successful school, what rate of academic progress is acceptable, and what to do when schools are not meeting our expectations. “We need to ensure that New York’s schools provide every child with a quality education—and these are the voices that are too often missing from the conversation and that should be listened to carefully by state policymakers as they make key decisions about how to take advantage of the opportunities and levers in ESSA,” said Ian Rosenblum, Executive Director of The Education Trust–New York, which commissioned the poll on behalf of a statewide coalition of civil rights, education, parent and business organizations that includes the Buffalo Urban League, The Business Council of New York State, Business Council of Westchester, Capital Region Chamber, Committee for Hispanic Children and Families, DFER-New York, District-Parent Coordinating Council of Buffalo, Educators for Excellence, EPIC-Every Person Influences Children, High Achievement New York, National Center for Learning Disabilities, National Council of La Raza, New York Educator Voice Fellowship, New York Urban League, Otsego County Chamber of Commerce, Public Policy Institute of New York State, and United Way of New York City. 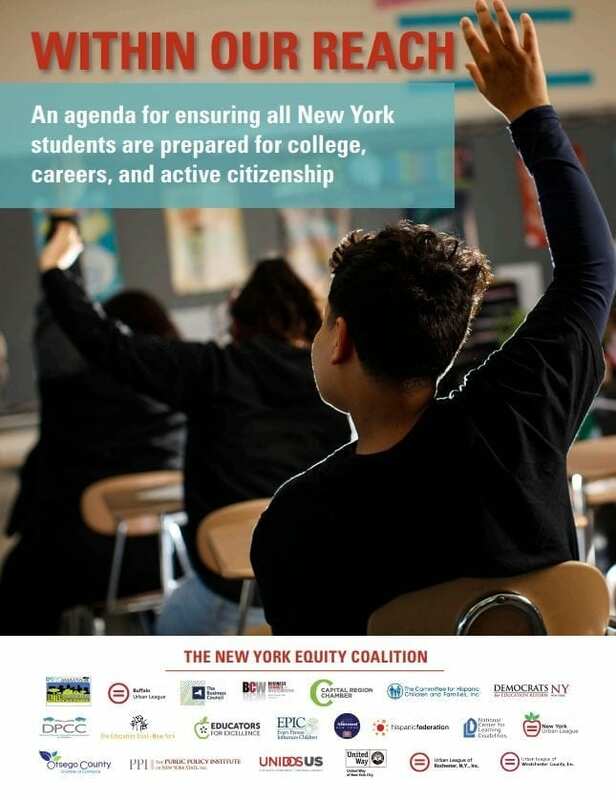 Coalition members believe that ESSA’s call for states to redesign their accountability policies presents a critical opportunity and important step to remedy New York’s education system—a system riven by massive systemic inequities in access, opportunity and performance, especially for students of color, low-income students, students with disabilities and English learners. Kiley & Company is a Boston-based opinion-research firm that has provided polling services to a variety of political, public policy and corporate clients for more than 35 years. The firm has extensive experience conducting voter research in New York State and New York City. The poll, which has a margin of error of plus or minus 3.2 percentage points, asked parents about their thoughts on the current state of public schools, whether the state education system is working for their children and how they think it can be improved to work for all students. 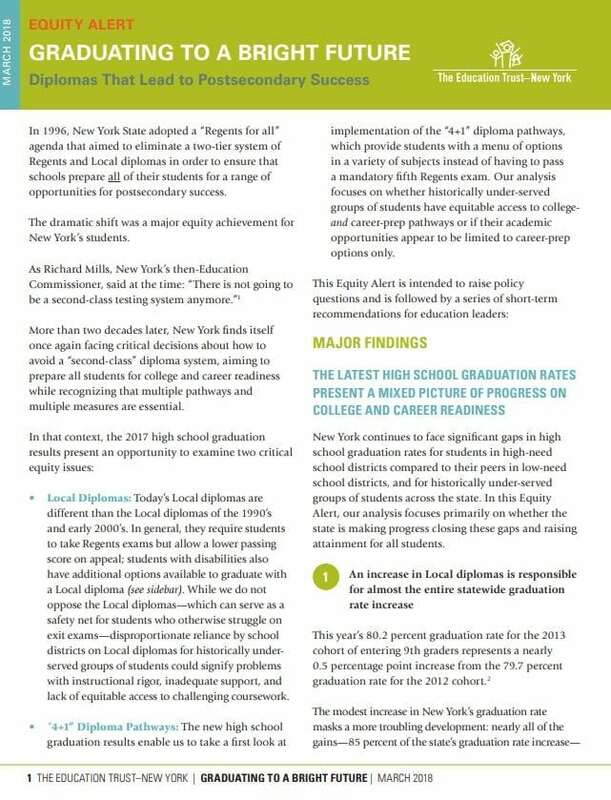 It polled public school parents by telephone from across New York State and was conducted in English from November 17-23 with a demographic selection that closely mirrors the current demographics of New York State public school students. The poll memo can be found at this link. More information about the coalition can be found at www.EquityInEdNY.org. The Education Trust–New York works to eliminate the gaps in equity, opportunity and achievement that hold back too many students from reaching their full potential, especially those who are low-income or students of color, in order to enable all students in New York State to achieve at high levels—from early childhood through college. 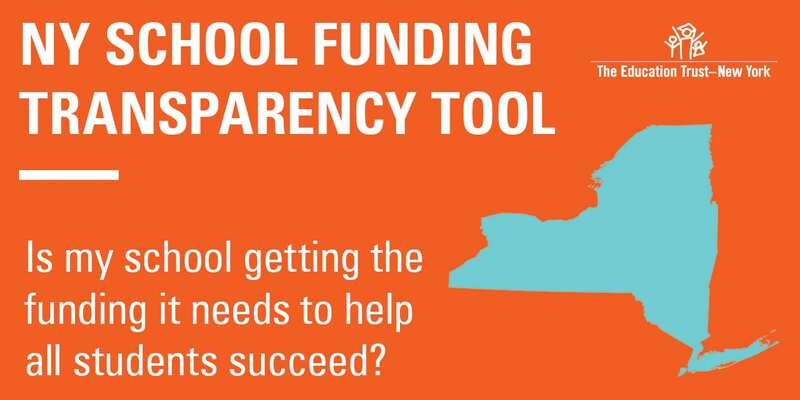 Learn more at www.EdTrustNY.org.